The transformation of the underutilised riverfront land stretching behind 1 William Street to the Goodwill Bridge has made great progress throughout September. In this area, our appointed contractor Multiplex is building the first public realm for Queen’s Wharf Brisbane – Mangrove Walk and Waterline Park – as well as upgrading the first 500 metre section of the Bicentennial Bikeway in the precinct. All three areas are expected to be complete in the second half of 2019, as part of a total of 12 football fields of public space that Queen’s Wharf Brisbane will deliver to locals and visitors. Multiplex Project Manager Tyson MacDonald said marine piling works to build Mangrove Walk – a 450 metre-long above-water pedestrian walkway – are now reaching depths of up to 25 metres below the river bed. “The Brisbane River tides have worked in our favour with a total of 31 piles driven this month, while a week of morning high tides has led to a peak of three driven piles per day,” Mr McDonald said. 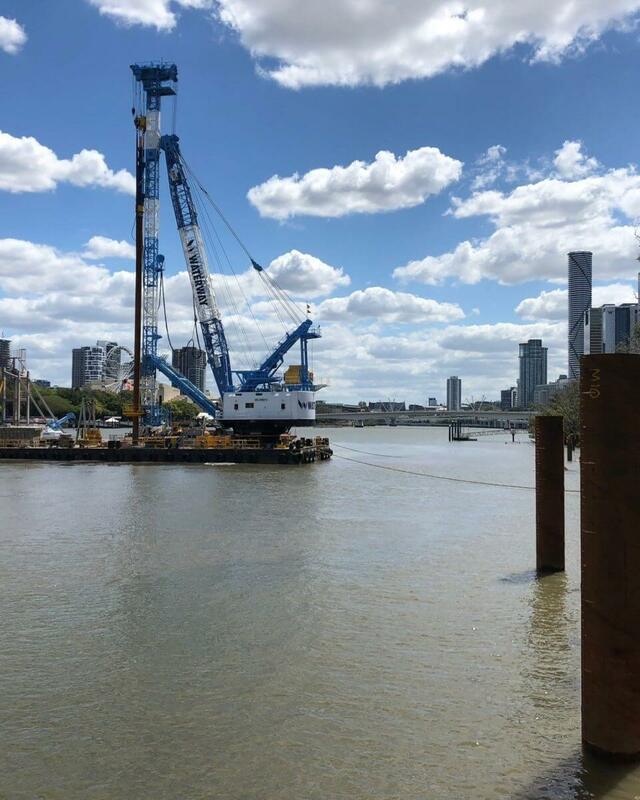 “The driven piles are installed using a nine-tonne hydraulic impact hammer anchored to ‘Kochi’, which is our largest barge working out on the river. “Kochi is working its way upstream from the QUT ferry terminal and making great progress. Meanwhile, onshore works on the first 500 metre section of the Bicentennial Bikeway to be upgraded in the precinct is now underway. “We are increasing the cycle lane width to three metres, improving the lines of sight, and removing dangerous pinch points,” Mr McDonald said. Finally, the new and colourful artwork underneath the Riverside Expressway and part of Waterline Park has now been completed, providing a glimpse of what will become a striking and vibrant public park for pedestrians and cyclists in the future. “Waterline Park will be a subtropical recreational park that beneath the brightly coloured artwork will feature grass and shaded seating areas, outdoor exercise equipment, and outdoor tennis tables,” Mr McDonald said. Meanwhile, civil construction works have begun to build Waterline Park including services relocation activities and minor excavation activities to level the site. Mangrove Walk, Waterline Park, and the upgrade of the first 500 metre bikeway section are the first part of the foreshore to be redeveloped, with the remaining 500 metres of riverfront – from behind 1 William Street to the Victoria Bridge – to be improved in future years and be completed by 2022. To stay informed about future construction activities or see the latest site images, visit our Facebook page www.facebook.com.au/queenswharfbrisbane.